En papillote is French for "in parchment" and refers to baking food in a folded pouch. It is the perfect cooking method for salmon fillets, asparagus and lemon slices. After the flavors have blended and the salmon has cooked, open the packets and top with our fresh-tasting lemony gremolata. This simple, yet impressive baked salmon dish proves healthy doesn't have to be bland and boring—and fancy doesn't have to be difficult. Cut 2 pieces of parchment paper, each measuring 12 inches by 17 inches. Fold in half and crease; then open and lay flat. Lay salmon against crease and asparagus against the salmon. Drizzle with olive oil, salt and pepper. Lay lemon slices on salmon. 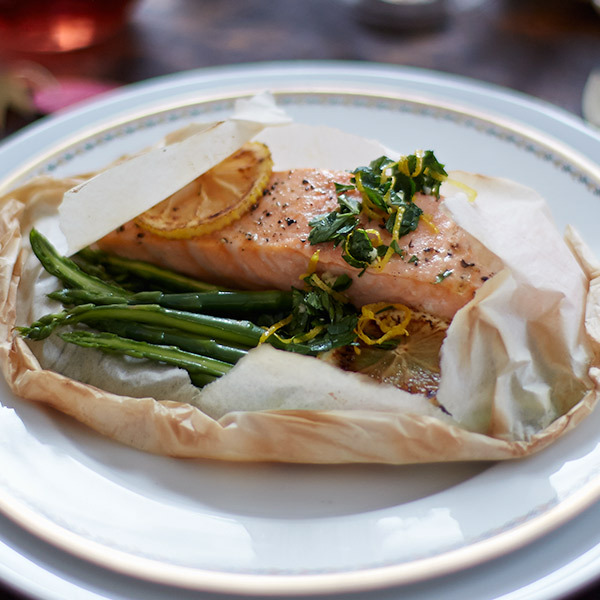 Fold top of parchment over salmon and asparagus. Starting at one end, roll parchment into small pleats to seal edges together and make a half-moon pocket. Place each parchment bundle on a sheet pan, and bake for 15 minutes. While salmon is cooking, make gremolata. Mix together parsley, lemon zest, olive oil, garlic and preserved lemon in a small bowl. Set aside until ready to use. When salmon and asparagus are finished cooking, transfer to serving plates. Carefully tear open packets and serve immediately with gremolata.